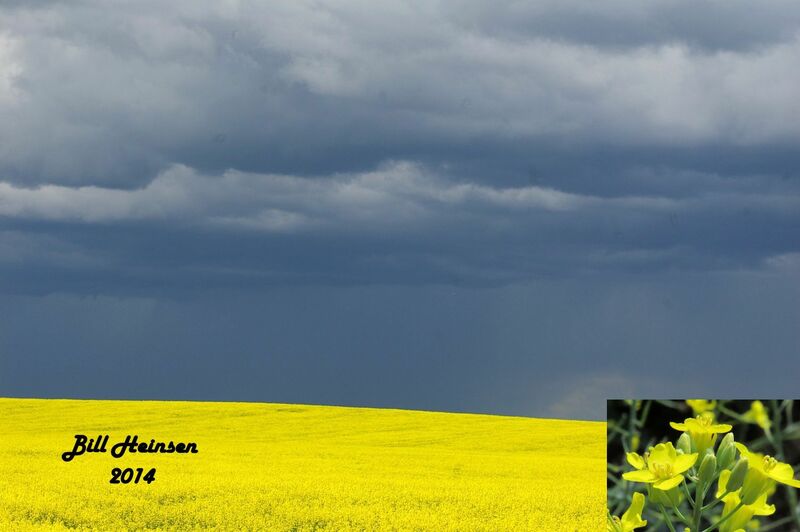 Canola field against approaching thunderstorm. Below Sundre, the Red Deer River traverses the Alberta parkland and prairie regions. Agriculture and the petroleum industry are the primary industries in this ares. 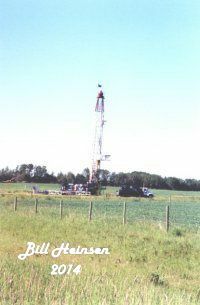 In 1975 the Alberta Government first proposed to build a dam on the Red Deer River near Dickson. We were subjected to a huge amount of information and propaganda from the Department of the Environment. These purported to show that the dam was necessary to produce enough water to allow several very important developments downstream. Implicit in the information were occupational and recreational facilities that would be created: swimming and canoeing in a lakeside setting, farmers, large trucks, earthmovers and petrochemical plants. The subliminal message was, “jobs for your kids and your neighbours kids, too”. Prairie farmland typical of the Red Deer River Region. Most of those jobs were to materialize in a petrochemical industrial boom once the dam was completed. One soon discovers that the petrochemical industry and cities do not consume water; they only use it. Almost all the water a petrochemical plant or city takes from the river, is returned to the river. The dam was simply not required for municipal growth or for a petrochemical industry. The Science Council of Alberta supported these findings by pointing out that ethane-containing natural gas was the limiting factor in the Alberta petrochemical industries.The Government’s claim to be able to complete the dam for $45 million fell short by about $80 million. Oil drilling is a major occupation in the Red Deer River watershed. Swimming in the reservoir is not practical because there are no beaches and the water remains very cold all year. A few people use power boats on the reservoir. Dangerous undertows prohibit canoeing on the reservoir. Fish are contaminated with mercury. A couple of resorts have been build on/near the reservoir and a few campgrounds attract some weekend visitors. Other than Canada Geese and Mallards, few waterbirds use the reservoir or the spillway. A small colony of American White Pelicans seem to have taken up nesting above the reservoir. 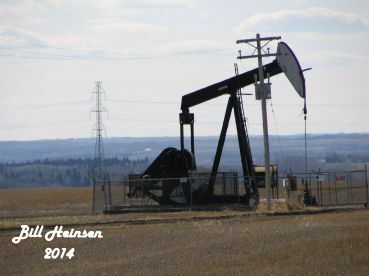 Unfortunately, in 2013, a pipeline under the Red Deer River upstream of the reservoir ruptured and spilled a large amount of oil into the river. A clean-up was effected and eventually the mess was declared clear. Still there are many old pipelines in the area, some more than 50 years old, that crisscross the land. “Donkey engine” like this are a common sight in Central Alberta. They are used to pump oil out of the ground. An Inter-Provincial water agreement requires Alberta to release half of the water that would normally run into Saskatchewan to that Province. By augmenting the flow of the Red Deer River, Alberta has been able to draw more water from the Southern Rivers for other uses. In a very real sense, the Dickson Dam has made the Old Man River dam possible. Apparently the Dickson Dam was built for the irrigation districts of Southern Alberta. Before the Dickson Dam was built, Red Deer River was home to a great diversity of resident fishes. Early in the 20th century, montane and foothills species such as the bull trout, mountain whitefish, spoonhead sculpin, and mountain sucker occurred in abundance. From the mouth of the Raven River and down to the prairies, the river teemed with northern pike, walleye, sauger, burbot, goldeye, and several other species. 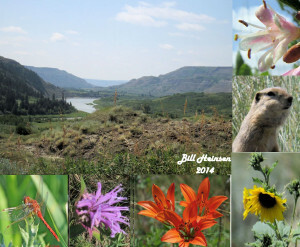 From the Raven River to the upper badlands, a diverse mixture of plains and foothills species occupied the river making for a rich sport fishery. Adult bull trout are gone from most of the river. Large northern pike have also declined from excessive harvest and reproductive problems caused in part by the building of the Dickson Dam. 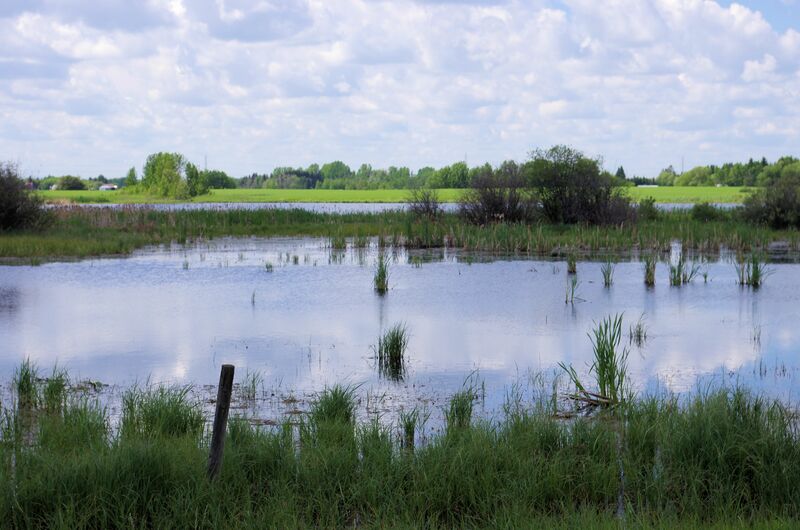 Nursery areas for fish in lower reaches of the river and in tributary streams formerly flooded by high spring and early summer water levels in the Red Deer River are reduced in both quantity and quality. The number of larvae of mountain whitefish that hatch and survive downstream from the Dickson Dam has been reduced sharply. Formerly they hatched synchronously following breakup and grew well in the warm productive water along the shore. Today larva hatch in March when the water is cold and unproductive. They grow little and die before a meaningful effect on populations occurs. Spoonhead sculpin, indicators of water and substrate quality, have almost disappeared downstream from the Dam. Brook, brown and cutthroat trout have been successfully introduced into the upper Red Deer River and its tributaries. In the lower river, the formerly rare mooneye has significantly increased since the 1970’s. Lake whitefish have also become common in the lower river, probably through inadvertent introduction from irrigation canals in Southern Alberta. Adult fish are present, but there is no evidence of successful reproduction. While introductions have increased species diversity and enriched the fishery in the upper Red Deer River the once excellent fishery of the middle river is severely depleted. Expensive put-and-take stocking of brown and rainbow trout is a poor substitute for good stewardship. There are 1000’s of small ponds like this in the middle regions of the Red Deer River. Millions of waterfowl rely on these for breeding. Canadian toads still spawn in backwaters and flooded areas adjacent to the river however spring flow regulation has reduced suitable spawning areas for these amphibians. Fractured sandstone bedrock along the banks of the river, tributaries and coulees provide hibernacula for a number of snake species notably the red-sided garter snake from the City of Red Deer and upstream and for the bull snake and prairie rattlesnake in the lower badlands. 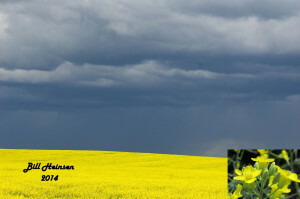 As the river leaves Red Deer, it cuts across some of the best farmland in Alberta. Before the Pleistocene Era, the Red Deer River probably ran north from the vicinity of Red Deer. Its eastward turn is of more recent origins. It has carved a canyon as much as 200 metres deep as it changed its course. The canyon that the river now occupies is certainly from an earlier time, but was blocked with ice causing the river to drain in several directions during the times of the advancing and receding glaciers. One of those channels is easily seen looking to the southeast from Antler Hill, north of Innisfail. Unfortunately, the Dickson Dam has caused erosion patterns to change considerably, including at Burbank. The spring ice breakup no longer scours the banks clean, or undercuts them to expose new surfaces. As a result of this and construction at Burbank Park, the riverbanks are becoming overgrown with weeds and bushes. The Dry Buffalo Jump Provincial Park is the approximate north end of the dinosaur bone beds for which the Alberta Badlands is noted. Starting in the 1920’s, many skeletons have been found here and downstream. Here the effects of 12,000 years of erosion are clearly visible. A wide variety of plants and animals can be found the this park.